District Youth Festival-2017 concluded at Desh Bhagat University with marvelous response and left behind everlasting memories. 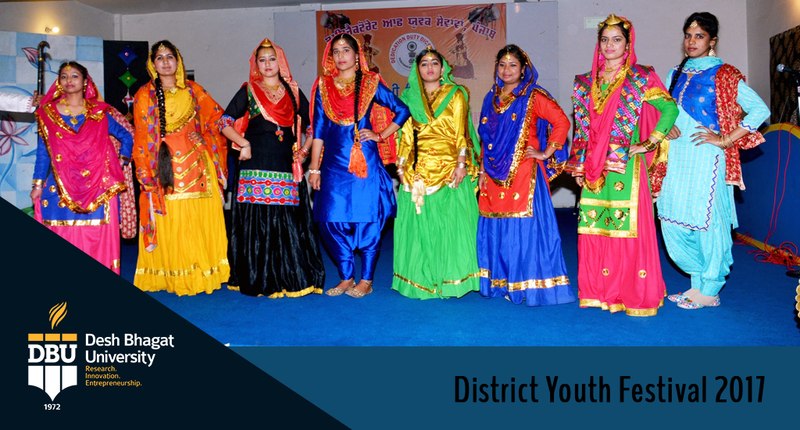 The event was organised in collaboration with Directorate of Youth Services, Punjab and in association with Assistant Director Youth Services, Fatehgarh Sahib. The valedictory function was presided over by Chancellor Dr. Zora Singh. Speaking on the occasion, he appreciated the performances of each and every college teams which participated in the youth festival. 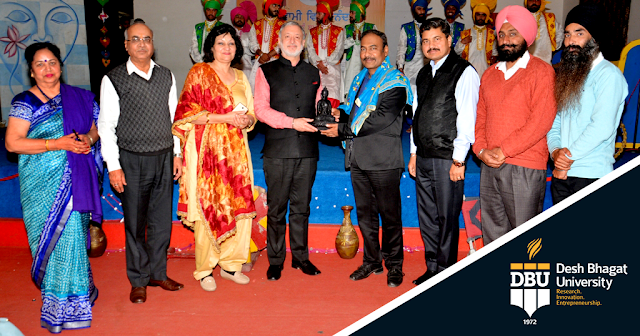 Sr. Balvinder Singh Malhi, (Principal, Cordia College, Sanghol) was the chief guest on this occasion. Giving more details, Pro Chancellor Dr. Tajinder Kaur said that the last day of the festival was observed as Youth Day which is/was dedicated to Swami Vivekanand Ji. On this occasion/In this concern Desh Bhagat PG School of Dental Sciences organised a Blood Donation Camp, in which students and staff members contributed 27 units of blood. The special attraction of the last day programme was the finals of different cultural activities.Vice Chancellor Dr. Virinder Singh disclosed that on the last day, there were final competition of Traditional and Cultural activities like Bhangra, Gidha, Solo Song and Mimicry etc. In Bhangra- Cordia College, Sanghol won first prize while Desh Bhagat University got Second position, In Giddha. Desh Bhagat University (First) In Waar Singing – Gurminder Singh (First), in Lok Saaz-Harinder Singh (First), in Folk Song Swaranjeet Singh (First) and Kulwinder Kaur (Second), In Mimicry-Abrar(First) , In Puratan Punjabi Pehrawa- Primalpreert Kaur (First) and Amrit Singh (Second), In Slogan Writing Arshmanjot(First) and Gurmeet Singh (Second), In Poetry Jasleen Kaur(First) and Prince Bhalla (Second), in Speech Arshmanjot Kaur(First), In Essay Writing Anjume (First) and Arshmanjot (Second), In Poster Making Anita Verma (First) and Priyanshi singh was adjudged (Second). In Riwayti Lok Kala Muqabla, Naala Bunna- Kamaljeet Kaur and Gagandeep Kaur, Pakkhi- Kuljeet Kaur, Fulkari-Kamaljeet Kaur, Chhiku- Harleen Kaur and Sarabjeet Kaur , all from Pine Grove College Of Education, Bassi Pathana were declared the winners. Director Education Dr. Surjit Patheja and Assistant Director Youth Services, Fatehgarh Sahib Dr. Dilver Singh thanked all the guests and expressed happiness over the overwhelming response received for the success of this mega event. They thanked all the university authorities, faculty members, employees and students for their wholehearted cooperation and active participation in every activity for the success of the event. Directors and Hod’s of the various faculties, teachers of different institutions and large number of students were present on this occasion.